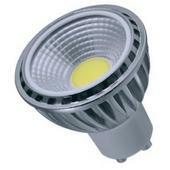 This LED GU10 Dimmable COB 3000k warm white lamp can be used as a direct replacement for a 50w halogen GU10. We have tested the lamp and particularly recommend the Varilight V-Pro range of dimmers. The lamp has a 90 degree beam angle and an average lifespan of 50,000 hours. It has an aluminium alloy shell and incororates a very effective heat dissipation system giving low heat and emits no UV or IR.